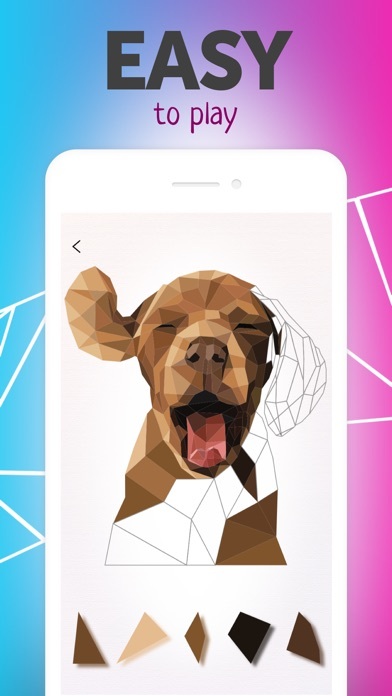 What amazing pictures we have in our Low Poly Art game. 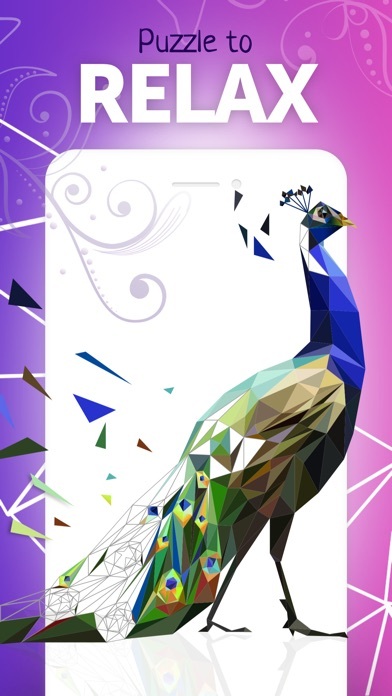 Poly… is an amusing puzzle game that sharpens your mind and help you relax at the same time. 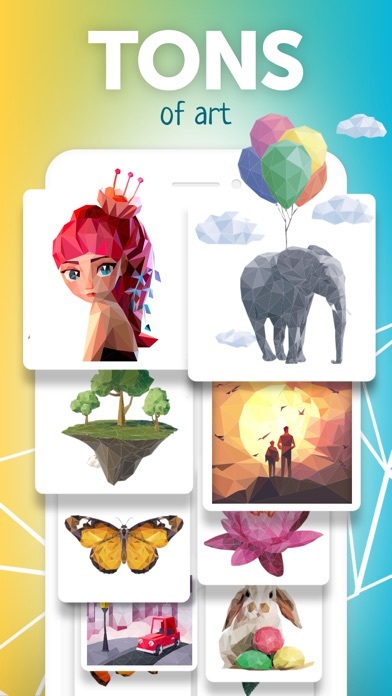 Download and you will get: - Huge collection of pictures-puzzles. All of the are free! No subscription needed, no hidden fees! 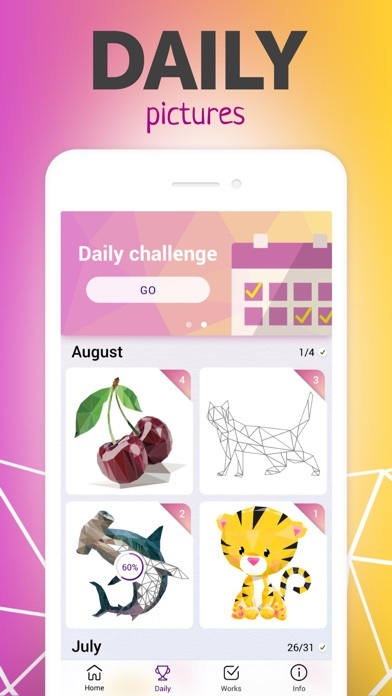 - Surprising collections of flowers, fantasy, animals, people, landscapes and many other fantastic bright puzzles - Daily challenges and therefore a sense of fulfillment when finished; - Hints that help you find a place for a piece; We hope you will enjoy this beautiful puzzle game as we do! I love working the puzzles but until about March 6 or so there was a daily puzzle of the day; now, no more new puzzles. What happened? I absolutely love the polyhedral puzzles, and it’s fun trying to figure out what the end result will be while completing it. Plus there are corgi puzzles! The only thing I’m a little disappointed in is that I haven’t been getting any new “daily” puzzles since February. All February is represented, but no March at all. I’m not sure if it’s a bug or what, but it’d be nice to get that fixed. Where are the daily puzzles? No updates since I paid for it! The daily puzzles have not updated since March 5th. Love it, but miss the new puzzles. Even uninstalled and reinstalled the app. Very disappointed. Update: they are not updating this app with new puzzles regularly which makes it feel stale. Definitely not worth the ad removal fee I do wish the new puzzles would be featured when you open the app but other than that it is great for relaxing and killing time. Need options able to change background colors many pictures have white pieces which makes it hard to see! This game keeps me coming back for more ! But, please....since completed pictures stay on “ My Feed “ , Can you please remove the completed pictures from the “ALL” page ? Also....all I see are the “free picture” of the day. Does this mean you have in-app purchases for more ? Unique and Fun Coloring App! Finished my first picture by beginning with the apps daily choice. By starting their daily picture I found it extremely helpful in figuring out how to work the puzzle and color the picture. 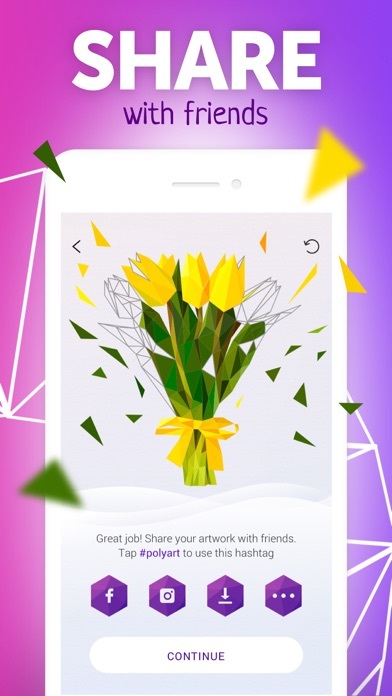 I know that I’m going to enjoy coloring the Poly app pictures! Thank you so much!